After the stress of last weekend, I was relieved to be back in familiar territory, within the realm of cute, colourful and creative. 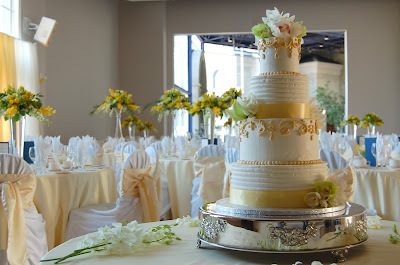 I know that I can do elegant and fancy but there is such comfort and joy in getting creative license to dream up something equally appealing to the eyes and stomachs of children and adults alike. 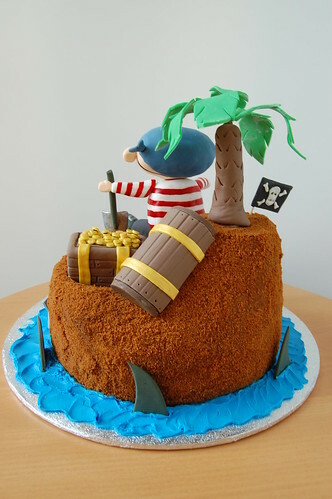 For Isaac's birthday cake, I was given simply the theme "Pirates", shown the Evite and encouraged to just create. This is why I love what I do! 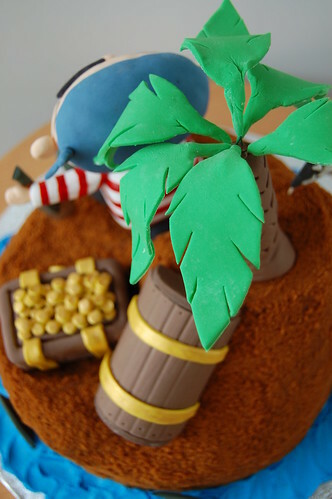 So, I carved the 9" round vanilla cake with chocolate mousseline to allow for appropriate topography in order to integrate a palm tree and buried treasure. 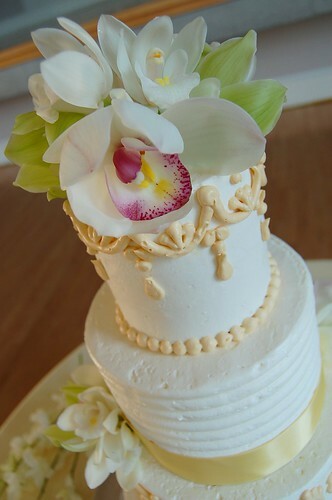 This was masked and coated with toasted cake crumbs to resemble sand (an excellent and frugal way to use up leftover cake trimmings). 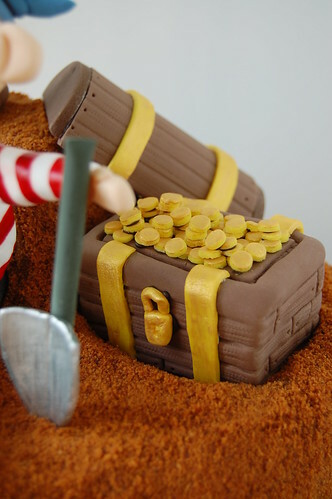 Rice Krispie treats were used to form the treasure chest and the head, torso, and legs of the pirate, and later covered with fondant. Adding some tylose powder to fondant, I used this pseudo-gum paste to craft the rest of the pirate paraphernalia and allowed everything to dry for several days before assembly. The most delicate item was the palm tree which involved wiring each frond separately before inserting and securing them into a pre-made hole within the tree trunk. 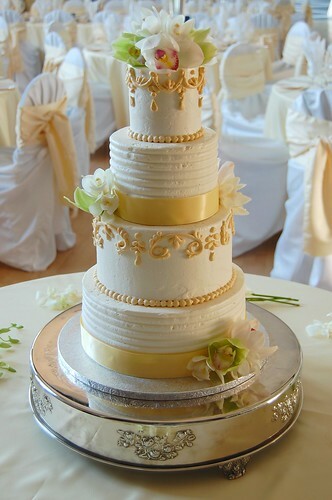 The most tedious item was the collection of tiny gold coins which were all cut out using my #802 piping tip, dried, and hand-painted with gold before individually glued onto the chest with royal icing. I must mention my favourite items, the antique map (I burnt the edges with my blow torch) and the circling sharks lurking in the ocean. 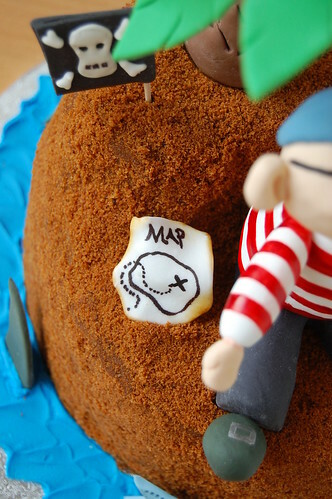 Although these two details were the simplest to make, they certainly add some whimsy that gives the overall cake more character, in my opinion. 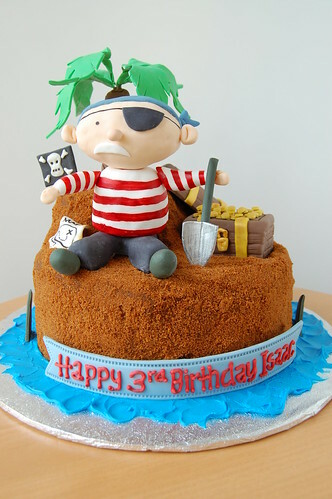 Happy Birthday Isaac!